Information and its management is central to modern society. Organizations – private and public, national and international – have recognized that information is a key resource and that its management is critical for success. 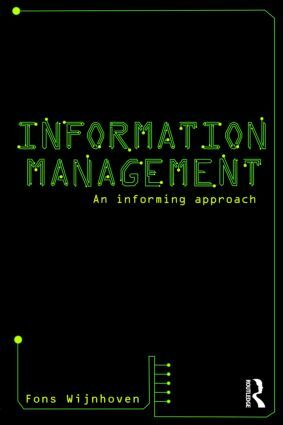 Existing books on information management focus on the abilities of computers to process data, the development of information systems, and the management of IT resources. They often start with the computer as a key issue. Although Information Management acknowledges the importance of computers and data communication, it starts from a deeper understanding of the concepts of information and knowledge, and on the basis of this understanding, derives methods to use computers effectively. This textbook provides graduates of any discipline with an understanding of the theory and practice that underpins information management, and introduces students to the concepts and applications of information management techniques in a variety of organizational contexts. In giving students strong philosophical foundations, Fons Wijnhoven's book will prove to be an excellent primer in information management.